Mario, champion of the working class. 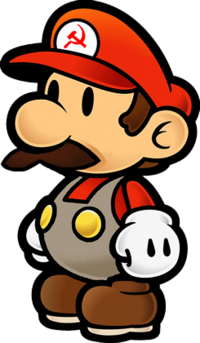 Hey yo, I'm Son of Suns, one of the Bureaucrats of the Super Mario Wiki. I am a college student, and as such I will not be able to work on the wiki as much as I'd like. However, I will do my best to improve the wiki when I can. Also, if you have any questions or comments, you can always turn to me for help. The Son of the Sun from Chrono Trigger. Above: The Son of the Sun, protected by five Prominences. Below: The Son of the Sun, unprotected. I am happy to be back. I am trying to find fun in the wiki again, and I am finding that fun in exploring the huge universe Nintendo and other game developers have created. I am trying to make connections, expand content, and just work on what I want. My focus is definitely on the fictional universe instead of the physical video games. I am trying to keep this wiki a low-stress hobby. 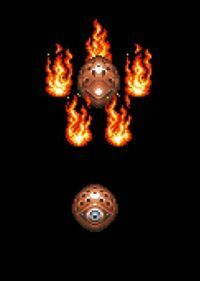 I believe every officially named element (be it character, item, or place) deserves a wiki article, regardless of how much content is available. This is a philosophy I hold on to, as it shows that we feel everything in the Mario universe should be given recognition and status. I wonder who exactly is the Subspace Emissary. I like to keep a notebook and a pencil next to me while I play Mario games and read official game materials, such as instruction booklets and player's guides. This helps me organize my thoughts before I expand articles. I find it helpful to have a place of reference to look back to, instead of trying to remember everything I know about a subject. I think I also make notes that I would never have realized if I did not jot them down while playing. I greatly value instruction booklets. They can contain a wealth of knowledge. I try to save as many booklets as I can, to use for future reference. Sometimes they contain information that cannot be found anywhere else. Although Diddy Kong Racing and Star Fox Adventures features a similar character named Tricky, they should not be considered the same character. Rare may have originally planned both to be the same character when SFA was still an independent IP called Dinosaur Planet, but they ultimately emerged as distinct characters when the game took on the Star Fox license. There is no link between the two Trickys in Mario's fictional universe. We must remember Donkey Kong is the basis for everything we have created. Just imagine if Nintendo has acquired the rights to the Popeye franchise in 1981. We would all be playing Super Popeye Galaxy today. My favorite Mario game of all time? Super Mario RPG: Legend of the Seven Stars. Has anyone noticed that Dimentio shares many many many similarities with Kefka, the greatest video game villain of all time? I'm excited for the future, and all the possibilities it may hold. Welcome...welcome new Mario Wiki!! My work here includes trying to make the Mario universe more coherent in its incoherence. Solid Snake's codec conversations are freakin' amazing!! I am so glad he was included in Brawl. I can Do the Mario. 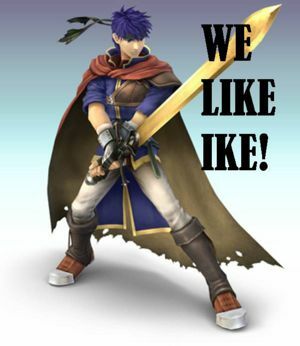 Vote for Ike! He fights for his friends. 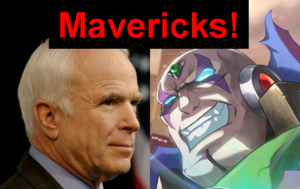 McCain and Sigma, two old bald war veterans that went MAVERICK!! WARNING: These videos may contain "explicit" content. This page was last edited on January 24, 2019, at 04:44.